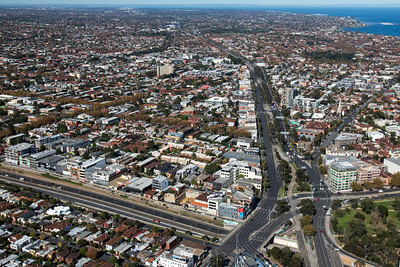 In the face of a tidal wave of high rise high density developments (like 3 StKilda Rd pictured and others), for many years JAAG has been strongly asking City of Port Phillip to develop a watertight set of precinct planning controls for the St Kilda Junction area and south down St Kilda Road including Wellington Street, seeking a framework that provides clear ‘built form’ controls, including height and density limits, limits on future land use and urban design principles, and that also address issues such as transport connections and streetscape linkages. The Minister authorised Amendment C122 in May 2016 and it was exhibited from 8 August 2016 to 12 September 2016. The Minister for Planning introduced interim height and overshadowing controls, by exempting himself from the requirements of sections 17, 18 and 19 of the Planning and Environment Act and the regulations, by Amendment C145 to the Port Phillip Planning Scheme. Gazettal took place on the 6th April, 2017. A panel hearing was held over 6 days between 21 March to 28 April 2017. The A report was developed by the independent Planning Panel which was received by Council on 19 June and released to the public on 17 July 2017. Council unanimously adopted the report and recommendations of the independent Planning Panel at its meeting on Tuesday 19 September 2017, with respect to Amendment C122 to the Port Phillip Planning Scheme with changes as per recommendation (option 2) of the Council Officers report to Council with 3 additions suggested by Cr Copsey predominantly re the west side. Details of the changes made at the adoption stage of Amendment C122 are outlined in the report and attachments presented at the Ordinary Council Meeting on 19 September 2017, available at http://www.portphillip.vic.gov.au/september-2017-meetingsagendas.htm. The adopted Planning Scheme ordinances, maps, incorporated documents and reference documents are available on Council’s Amendment C122 website at http://www.portphillip.vic.gov.au/Amendment-c122.htm. JAAG received acknowledgment for its contribution to this Framework. The Framework is not perfect, but at least it is better than none at all. Only one more step in the process now with the final decision by the Minister! Thank you all for your support and contribution to this important piece of strategic planning for St Kilda Rd South. Click link below for the Panel Report on the Port Phillip Planning Scheme Amendment C122 St Kilda Road South Precinct released by Council in July 2017. While Amendment C122 progresses, Amendment C145 proposes to insert Schedule 27 to Clause 43.02 – Design and Development Overlay (DDO27) to introduce discretionary and mandatory overshadowing and building height controls on an interim basis. The controls introduced by Amendment C145 will apply to ensure that new development considers the amenity of the area and protects key aspects of the public realm. The controls are designed to protect the position while the separate amendment process is undertaken in relation to permanent controls i.e. to prevent inappropriate development taking place while permanent controls are formulated. Interim controls have been approved and were gazetted on 20 December, 2017. Following community consultation in 2014, the Draft St Kilda Road South Land Use and Urban Design Framework was considered by Council at the 9 June 2015 meeting. The draft Framework was released and community consultation held during July 2015. Community consultation closed 23 July, 2015. 55 submissions were received (including JAAG), reflecting strong community interest in the future of this precinct. The draft Framework was discussed at the Ordinary Council Meeting on Tuesday, 22nd September 2015, providing an opportunity for JAAG and others who had made written submissions, or have an interest in this matter, to make a verbal presentation directly to Council. Council unanimously adopted the Framework at its Council meeting on Tuesday 24 November, 2015 to progress implementation of the Framework through requesting Ministerial Authorisation to prepare and exhibit Planning Scheme Amendment C122; and request the Minister for Planning to introduce interim development controls via Amendment C121 whilst the permanent controls are progressed. JAAG welcomes the first stage of a three stage urban design and land use framework study that is due to be completed by Council by September this year. Developers have been successfully targeting Wellington Street and St Kilda Road south, especially through appeals to VCAT, in their quest to build hundreds of high rise units in buildings as tall as 27 storeys! When granting permits, VCAT has frequently been critical of Council’s lack of clear planning controls for the area. Ensure new development and change within the precinct is well managed. (The St Kilda Road South Precinct Strategic Study is totally separate from Council’s current consideration of proposed Residential Zones, and also separate from the Albert Park Lake Master Plan Project for which community input is now also being sought).